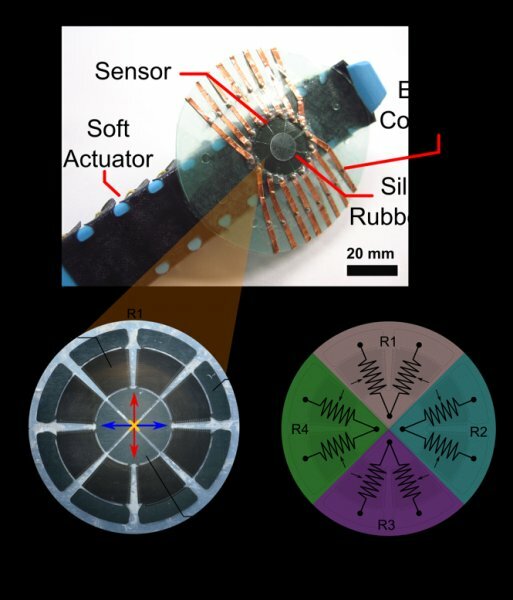 The development of soft, compliant force sensors is greatly sought after in areas such as soft robotics and prosthetics. Nevertheless, solutions for measuring forces in multiple axes, while being mechanically compliant, have been few and far between. Here we present a compliant sensor able to detect forces tangential and normal to the sensor surface. The transduction mechanism is based on the deformation of laser-machined carbon fiber composite (CFC) micro-scale meanders, encapsulated within elastomers layers. Strains in the elastomer are transmitted to the meanders, causing changes in the electrical resistance of the sensor contact mechanics. Configuring the meanders in a radial pattern, segmenting them into quadrants (two antagonist pairs) and biasing the center of the sensor out-of-plane enables detection of forces in multiple axis via differential measurement. Sensors were manufactured using a custom fabrication process and exhibited high mechanical compliance with a very low form factor. The sensors were experimentally characterized and demonstrated large differential changes in resistance (up to 26 kΩ for tangential forces applied to the sensor surface). We integrated our sensor onto a soft robotic gripper finger and demonstrated the ability to detect changes in friction at the actuator surface, thus demonstrating their potential for real world applications. A compliant sensor able to detect forces tangential and normal to the sensor surface is presented. Transduction mechanism based on the deformation of encapsulated micro-machined carbon fiber composite structures. Manufactured sensors are compliant with low form factors. Detection of friction changes on the surface of a soft robotic actuator demonstrated.